To understand the mechanism of premixed flame quenching by porous media, a zonal hybrid RANS/LES model was employed, in which the LES flow solver was used to resolve the large turbulent structures within the non-porous region, while RANS was applied to porous media zone. The predicted results were compared with previous experimental data. And it was evident that the premixed flame propagation rates and structure as well as quenching behaviors were reproduced by this numerical approach with a better accuracy. 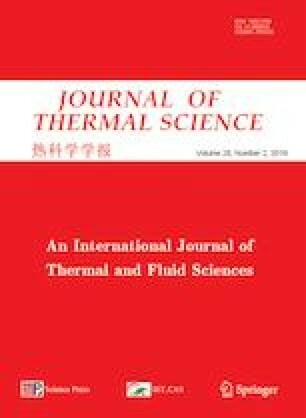 Due to the inherently higher heat transfer coefficients between the solid and gas phases in porous media, the gas phase temperature has been decreased rapidly. However, upstream obstacles can cause the flame propagating faster and thus reduce the axial gas temperature gradients, resulting in the invalidity of the operation of premixed flame quenching. By comparison with the case without upstream obstacle, the values of reaction rate attained in the case with three pairs of obstacles are higher, which makes a positive impact on the flame passing through the porous medium. In addition, the porous media with greater pore density has an excellent flame quenching property mainly owing to both the larger volumetric heat transfer and higher quenching temperature. This work was supported by the National Natural Science Foundation of China (Nos. 51174115, 51604095), the Research Foundation of Education Bureau of Henan Province of China (No. 14A410007) and the research fund of Henan Key Laboratory for Green and Efficient Mining & Comprehensive Utilization of Mineral Resources.